Walking into Question Bridge: Black Males, a newly acquired multimedia exhibit at the Oakland Museum of California, I’m immediately enveloped in hushed darkness. The space is quiet, plainly decorated, with the walls, floors, and benches practically disappearing in a muted, uniform black. Viewers watch video recordings with an almost reverent silence, their eyes fixed on the room’s only source of light: an array of brightly lit screens, with a black man in the center of each. 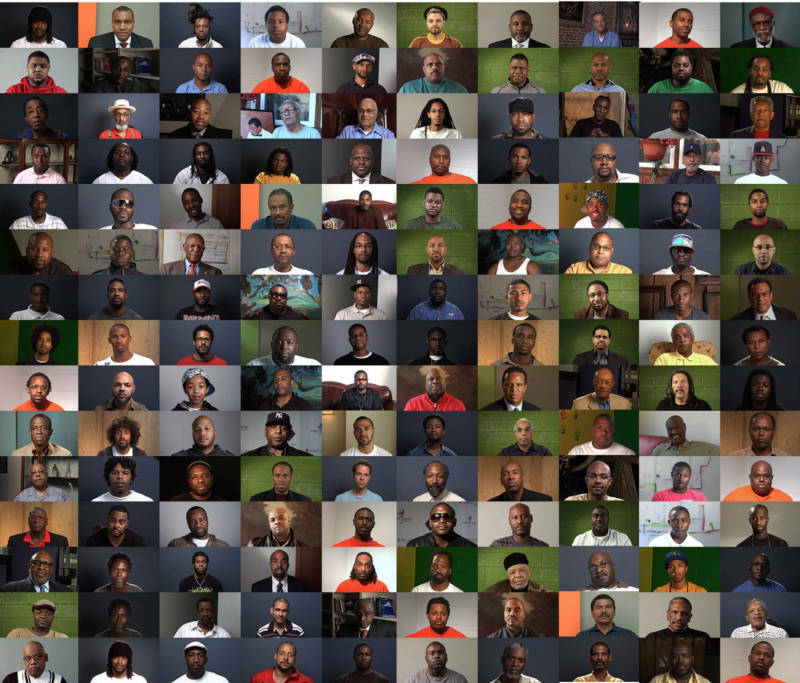 Directed by Chris Johnson and Hank Willis Thomas, in collaboration with Bayete Ross Smith and Kamal Sinclair, Question Bridge: Black Males has grown from its roots as a video installation into a full-fledged movement of national significance. 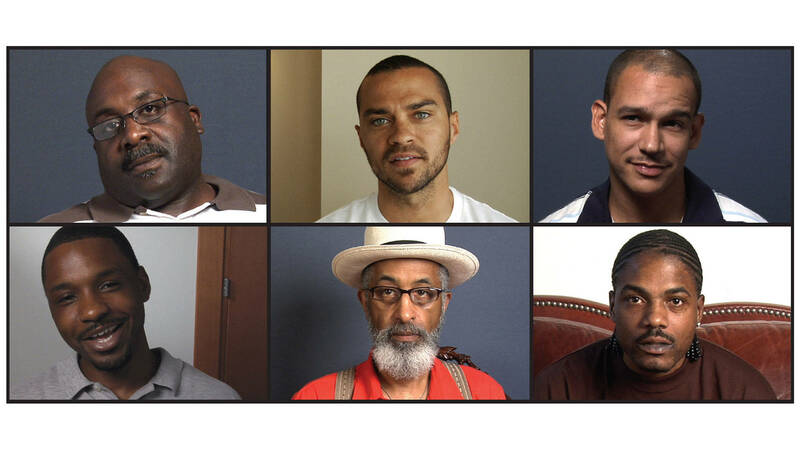 Originally shown at OMCA in 2012, the project was commended for its presentation of the black male narrative — and, most notably, its diversity across the American population. The breadth clearly comes across. When watching even a small snippet of the three-hour long video reel featuring 160 interviewees, it’s impossible not to notice the wide range black males from all walks of life — young boys, established judges, current prison inmates, famous actors and many more. “One [hope of the exhibit] is for folks to understand that black males are as dynamic, interesting, and complicated as everyone else. That folks will stop objectifying who they are — they’re human beings…[Their narratives] are expansive and complex and incredibly interesting,” shares de Guzman. Despite the range in location and physicality of those interviewed, Question Bridge: Black Males hinges on the notion that people are bound by their shared ideas and experiences. While viewing the piece, the men often appear to be talking with one another, each contributing a different perspective to an ongoing conversation — despite never having been in the same room. They discuss the use of the n-word, Post Traumatic Slave Syndrome, and how they know when they’re really in love — while maintaining a feeling of continuity, which Guzman explains was intentional. Creating a tangible, physical space to make room for such multi-faceted reflection is no easy feat — something de Guzman kept in mind while designing the exhibit. Rather than viewing interviews from afar, viewers are seated in close proximity to the spread of screens. In fact, the benches, placed in rows going away from the screen, even faintly recall the pews of a church. And the viewers’ collective quiet similarly contributes to the feeling of entering into a “sacred agreement [viewers] made with the project. That [they] were a guest to this conversation that is vulnerable, unique, and intimate,” according to de Guzman. Ultimately, every thoughtful, intentional choice in setting the exhibit sets the tone for its core purpose: Fostering conversation while providing a platform for black men to speak their thoughts, regardless of who or where they may be. Recounting an impromptu talk with artist and cofounder Chris Johnson on opening night, de Guzman explained how audience members thought that interviewees had extensively prepared their answers for the filming. 'Question Bridge: Black Males' runs through Feb. 25, 2018, at the Oakland Museum of California. Details here.